This unique close-fitting hoof boot is designed to keep wounds, poultices, and dressings clean. The boot is designed using flexible and light materials to enable easy fitting and as a cost-effective alternative to adhesive bandage and tape. It's perfect for aiding treatment of abscesses, punctured soles, and bruised soles. Single Boot. Suitable for use in the stable and can be used on sensible horses in the paddock. Bearing this in mind, exuberant horses and those having undertaken a period of stall rest may damage the boot by standing on it or doing racing stops. In these situations consider using a more traditional poultice for the first day turned out. To get the best out of your Medical Hoof Boot, do not use while horse is being ridden. Please measure accurately, as incorrect sizing can result in damage to the boot. 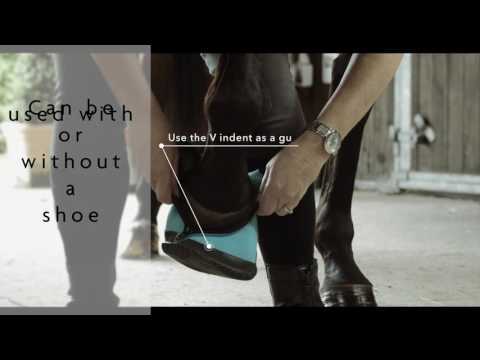 Do not use the Medical Hoof Boot in place of an overreach boot to prevent shoe loss. An overreach boot should be used to cover the Medical Hoof Boot on both front and hind hooves, and protect both horse and boot from damage. The boot is made to last 2-3 weeks under normal circumstances, and may last much longer. The boot is not indestructible and is not guaranteed against breakage due to the horse standing on the boot. These boots are fantastic! They fit perfect and are better then advertised. All my horses are rescues, so each come with special needs. I was looking at putting Lacy down due to severe Laminitis issues. I had tried 5 other boots with no success keeping them on due to her uniquely shaped hooves. These boots conformed to her feet and she cannot get them off. They look easy to put on and take off. Planning to use for a small pony with mild founder to see if they will make her more comfortable on hard ground. I borrowed one of these from a friend when my horse had an abscess. It was so convenient and kept his foot clean and dry. I had to have one for myself! This is the third one I have purchased. Sadly the last one only held up one night on my horse in wet conditions and ripped. Trying to find hoof boots for my foundered pony that do not rub. BEST ANSWER: No, they are sold individually. do they keep moisture out? Do they only work on front feet? BEST ANSWER: Suitable for use in the stable and can be used on sensible horses in the paddock, can be used with or without shoes. Please read over items product summary which is directly below items image.